Ukulele For Kids: Little hands need little instruments. And what could be more fun than a little ukulele? (Some of you probably started playing music with a ukulele.) It's small, inexpensive, and easy to play. 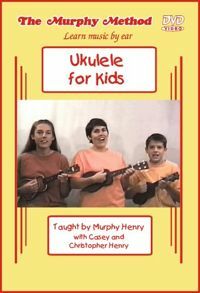 Start your kids on a fun-packed musical adventure with this ukulele DVD. Plenty of easy-to-play songs that kids will love. Also great for kids at heart! Featuring Casey and Chris Henry. No Tab.